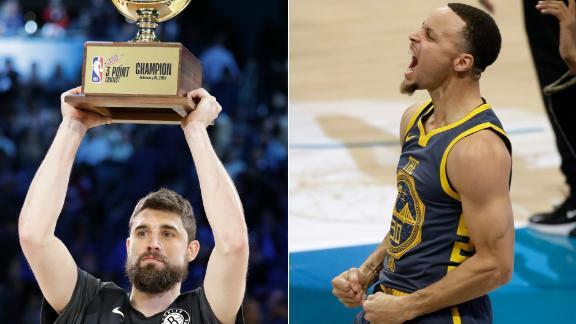 CHARLOTTE, N.C. -- Stephen Curry's storybook 3-point contest dream ended Saturday night at the hands of Brooklyn Nets sharpshooter Joe Harris. 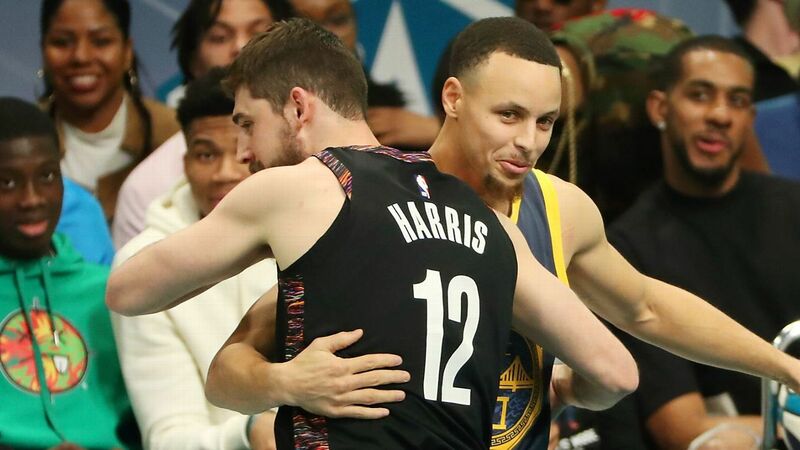 Harris, who came into the weekend shooting a career-high 50.1 percent from 3-point land, stunned a capacity crowd in Curry's hometown by knocking down 26 points in the final round, beating Curry's score of 24. "Obviously it's incredible," Harris said. "Steph is the greatest shooter of all time. Again, shooting off of the rack for a minute is not indicative of being a better shooter than Steph Curry. I don't want anybody to get it twisted at all. He's come in and won this thing [in 2015] and lost. He's participated a number of different times. So for me to come in my first time and to win obviously is quite a surreal experience." The 27-year-old set the tone as the first shooter of the night, knocking down 25 points in the first round, including all five of his shots in the moneyball rack in the left corner. "I think I was lucky to be the first guy to shoot," Harris said. "Because I was able to get kind of warm beforehand, and you don't really have a ton of anxiety because you can't have time to think about it. You're going right into it, right into shooting." Despite Harris' strong effort at the beginning, it was Curry who electrified the crowd in the first round, scoring a high of 27 points, including knocking down all five shots in his own moneyball rack in the right corner. He received a loud ovation after the performance as he excitedly made his way back to the bench. After Harris put up 26 to start the final round, Sacramento Kings swingman Buddy Hield managed just 19, clearing the way for Curry to win it at the end. Curry started strong, knocking down nine of his first 10 shots, but he cooled off in the middle two racks, missing four of his next 10 attempts. When he failed to hit his third attempt in the final moneyball rack, the contest was over. Curry, who won the event in 2015, initially said this was "most likely" the final time he would participate in the event, but afterward said he didn't know whether he would come back toward the end of his career, asDallas Mavericks great Dirk Nowitzki did Saturday night. Nowitzki finished with 17 points and did not advance. The big storyline coming into the event was that Curry, and his brother, Portland Trail Blazers guard Seth Curry, had a bet in which the loser had to pay for the winner's game tickets for family members each time they played for the rest of their careers. Seth finished with 16 points and did not qualify for the final round. After it was over, Curry said he wasn't sure he would collect on the bet since neither he nor Seth won the contest. But when reminded by reporters that he had previously said the highest score between the two won the bet, he relented. "A bet's a bet," Stephen said. "He shook on it." Prior to the contest, Stephen and Seth's father, Dell, admitted he was rooting for Seth to win since Stephen had captured the contest in 2015. Dell, who played for the Charlotte Hornets for 10 years, participated in his own contest before the event, taking part in a joint one-minute round for charity alongside former shooting greats Ray Allen, Mark Price and Glen Rice. It was a moment that will not be soon forgotten for the Curry family. "Honestly, I didn't think about it when I was out there," Stephen said of the bet. "It was just, I was watching him, just smiling ear to ear, wishing every shot went in. I'm sure he was doing the same for me -- maybe he wasn't if he was trying to win the bet. But it was just ... and seeing my dad behind the bench and the whole family up in the crowd was cool. So I will remember this for a long time." Despite Stephen's best efforts to win at home, Harris ended the night with his own memory of a lifetime. "I've said it a lot this weekend that a lot of guys in this league have got a unique path," Harris said. "It sometimes takes guys longer than others. Some guys come in right away and are able to contribute. But I think you look at the makeup of our Brooklyn Nets team, and it's a lot of guys that were sort of cast off and had a second opportunity. I personally was one of those guys, and I got lucky going into a situation, going to a Nets organization that had such a strong value and emphasis on culture, skill development, and I'm sort of a byproduct of that system." 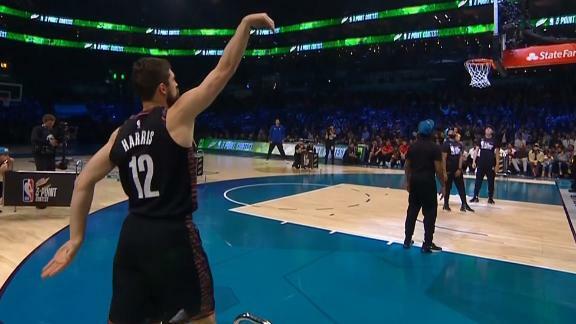 Steph Curry connects on his last 10 shots of the first round, but he can't catch Joe Harris, who wins the NBA 3-point contest.